Stunky in game: 4,495 Who? Important notice! Pokemon Stunky is a fictional character of humans. Stunky (Japanese: ??? 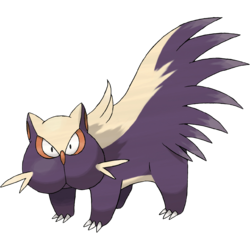 ?— Skunpoo) is a dual-type Poison/Dark Pokémon introduced in Generation IV. 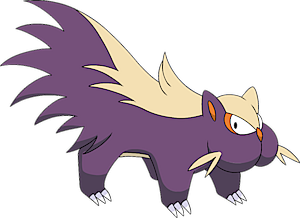 It evolves into Skuntank starting at level 34. Stunky is a small, skunk-like Pokémon with dark-purple fur. Its face is large and rounded, with a narrow red nose, red-rimmed eyes, and two pairs of somewhat "V"-shaped cream-colored whiskers on the sides of its face. It has two pointed ears that appear red on the inside. A stripe of cream-colored fur runs along its back from the neck to the tail, with a small tuft protruding from the base of the neck. 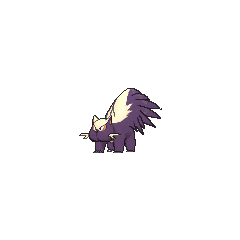 Its tail is raised high, and ends with spiked hair pointed behind it. It has a cream-colored underbelly, and four short legs, that end in paws with three small, white claws. Stunky can spray a foul-smelling liquid from its rear in order to drive attackers away. The stench can be smelled from over a mile away, and will linger for around 24 hours. Stunky first appeared in A Secret Sphere of Influence!, where it belonged to Officer Jenny. Another Stunky was shown to be under the command of a different Officer Jenny in Losing Its Lustrous!. A Stunky made a small appearance in The Rise of Darkrai as one of the Pokémon Darkrai hit with a Dark Void. 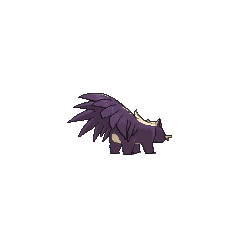 Stunky was also seen under Reggie's care in Lost Leader Strategy!. A Coordinator's Stunky was used in the Battle Stage of the Sandalstraw Contest in Old Rivals, New Tricks!. A Stunky also appeared in Battling a Cute Drama!. A Stunky is owned by one of the students of Snowpoint Trainers' School in Classroom Training!. A Trainer's Stunky appeared in A Marathon Rivalry! participating in the Pokéathlon held in Camellia Town. 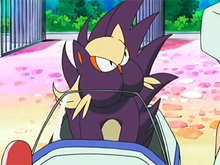 A Stunky appeared in the opening scenes of Zoroark: Master of Illusions. A Stunky appeared in Volcanion and the Mechanical Marvel during a flashback. DP036 Stunky Ash's Pokédex Stunky, the Skunk Pokémon. It protects itself by spraying a foul smelling liquid from its hindquarters which lasts for twenty-four hours. A Stunky appeared in The New World, under the ownership of a Galactic Grunt. Stunky in Diamond and Pearl Adventure! 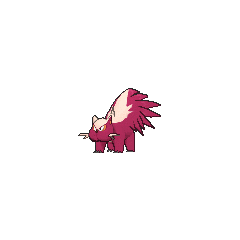 A wild Stunky appears in Pokémon Adventures, in A Big Stink Over Stunky. Its Stench caused Platinum to faint while riding down Route 206's Cycling Road. Stunky is one of the Pokémon Charon conditioned into a fighting machine. It was subdued by Hareta's Minun's Sing. The foul fluid from its rear is so revolting that it can make people feel queasy up to a mile and a quarteraway. Moves marked with a superscript game abbreviation can only be bred onto Stunky in that game. It scatters poison to attack. Stunky came to check out the Haunted Zone's Haunted House. He's bad to the bone at Dusknoir's Speed Slam. He feels comfortable in the Tech Area and runs around full of energy every day. For other sprites and images, please see Stunky images on the Bulbagarden Archives. Despite being based on a striped species of skunk, Stunky sprays from a handstand like a spotted skunk, as seen in the episode The Secret Sphere of Influence. It is based on a skunk, likely a hog-nosed skunk. It also bears resemblance to a cat of some sort, which is fitting as baby skunks are called kits or kittens. Stunky is a combination of skunk or stunk and stinky. Skunpoo is a combination of skunk and pyoo (what someone says when something stinks). Mandarin Chinese ??? Chòu Yòu Pu ?? refers to skunk, while ? is the transliteration of "poo" in its Japanese name.